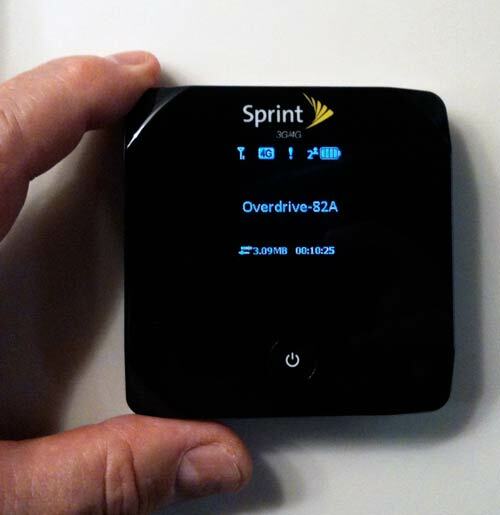 Sprint's "Overdrive" offers something that no other 4G product offers: it works with Mac OS X. I've been itching to test the 4G wireless broadband modems -- especially since our lab happens to be in a city that has extensive 4G (WiMAX) coverage. But none of the 4G modems offered by Sprint or Comcast work with Mac OS X. That changed on January 10th, 2010. "Overdrive" is a palm-sized, battery-powered WiFi base station that supports to both 3G and 4G networks. It works with any Mac or PC with WiFi hardware. Sprint has persuaded companies like Google, Intel, and Comcast to form an investment partnership in the WiMAX network developed by ClearWire. WiMAX is a term coined to describe standard, interoperable implementations of IEEE 802.16 wireless networks, similar to the way the term Wi-Fi is used for interoperable implementations of the IEEE 802.11 Wireless LAN standard. However, WiMAX is very different from Wi-Fi in the way it works. Blah blah blah. For you tech heads, I refer you to the WiMAX article on Wikikpedia. SpeedTest website or mobile app used for testing; Test server: Casper, Wyoming. As you can see, the speed experienced with the Overdrive depends on what device you are using. At least in the case of the MacBook Pro, the 4G Overdrive provided download speeds almost 4 times faster than the "best" Verizon 3G wireless broadband setup. Upload speed was faster but dramatically so. The iPhone 3GS download performance was pathetic when I tested in January when it averaged 90kbps download. The latest firmware update (April 2010) changed the download speed dramatically as you can see in the graphs. The iPad performs even better than the iPhone 3GS. So who should be excited about Overdrive? Anyone who wants a mobile hotspot for business trips or vacations should consider it. Commuters in trains, buses or car pools should find it useful. Got time on your hands in a home or business with no access to internet? Visting the bookstore with free WiFi but it's too slow? Eating in a restaurant or shopping in a grocery store with WiFi that's passworld protected -- and they won't tell you the password? No problem if you have the Overdrive in your jacket pocket or European Man Bag. It small (3" x 3" x .5"), light (4 oz), supports up to 5 users, and runs off battery power. It's a compelling companion for the iPad WiFi. Though the monthly charge for unlimited 4G service is pricey at $60, if you split it between five devices, the price per device drops to $12 per month. Though Sprint is happily demonstrating the potential of 4G wireless broadband with the Overdrive and other products, it's not clear how the future of 4G will all play out. For one thing, Verizon and AT&T chosen to use LTE (Long Term Evolution) wireless broadband protocol instead of WiMAX. The race is on to build out the 4G networks as well as to develop 4G cell phones, broadband modems, and routers. It will be fascinating to see what is available to the consumer in late 2010 and early 2011. I'm counting on Apple to have 4G iPhones and iPads already in development. Visit your local Sprint store. I suggest locating a factory store and phoning them to determine if you have 4G in your region and to find out whether they have the Overdrive in stock. It's also sold by Best Buy who was running a $50 special the last time I checked.